The holidays are ahead of us, which means you are going to have a long weekend with your family at home. Since that can be a little bit too much as it always is, we are going to get you through it using a language you can understand. 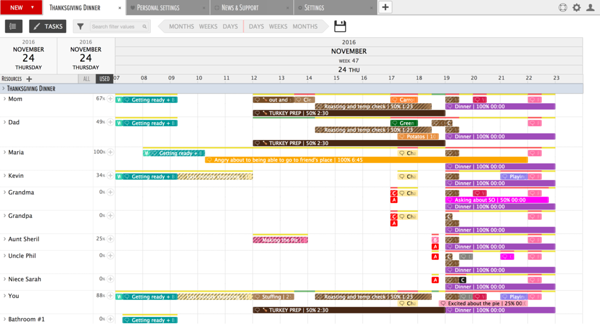 We are going to teach you how to plan the perfect (or a bearable) Thanksgiving dinner using resource planning software. That way you know when to keep away from the kitchen, and at what time your aunt and your dad will argue about the freshly elected president. Let’s start off by creating a project called “Thanksgiving Dinner”, and adding all the resources. You can add additional information about every person so you wouldn’t forget the things to worry about. Now, probably your mom and dad are going to do the shopping but that doesn’t mean that your resource planning software skills are going to waste. You can totally show that you are very successful and know how to do stuff. Just start by creating a task called “Grocery Shopping” and assigning it to your mom and dad. And here’s the part where you can make yourself look extra tech savvy - you can add all the links to the recipes to the tasks so your parents can just check them using our app. That’s definitely going to earn you some extra credit and take the attention away from the fact that you are once again coming to the Thanksgiving dinner alone. Unfortunately, planning the grocery shopping is just the start. The actual Turkey Day is when it get’s tricky. The secret is starting the planning from early in the morning. You might think that you can sleep in and enjoy your day off but no. That’s not what’s going to happen and you know it. Your little brother will wake up at 7, so will your parents. They don’t know what being quiet means and it’s just easier if you wake up with them. And remember - you will get yelled at by your teenage sister for taking your time in the bathroom. If you don’t want that to happen, suggest that she would go to the bathroom before you. That might mean you are going to have to wake her up. If that’s the case, the anger will be inevitable but you can handle it. You know there’s a nice breakfast waiting for you. Just concentrate on that. Probably there will be a small time window between the breakfast and the starting the turkey preparations. Don’t think you’ll actually have any free time. Assign yourself to do some last minute shopping and take your little brother with you. Since he is still cute he will make you a tiny bit less stressful. If you want the day to be as painless as possible, you should start with the food preparations start as early as possible. Remember that depending on the size of the turkey, it might take up to 7 hours to cook it and there are many steps to it. Again, to score some of those extra points for being a well-raised child, you should know all the steps and suggest to help out. And whatever you are doing remember to ask advice from you parents at all times. They will love it. Although the dinner starts at 7pm your grandparents will be there at about 5pm. Since you grandma insisted she should bring the cranberry jelly, pray to all your resource planning gods that she did. If she didn’t, thank yourself for going to the store earlier and buying some just in case. Take a bit of time to chat with your grandparents in the living room as they arrive. This just means your grandma won’t be able to look over your mother while she cooks. Your uncle Phil’s family will get there about half an hour earlier with the pie. Now you can get excited about the presence of the pie. The dinner will definitely start with the good old argument about who is actually the best turkey carver in your family. Whatever you do, don’t intervene. Make a note of it in your plan. You are going to have to be ready for someone (probably your niece) making a comment about the freshly elected president. 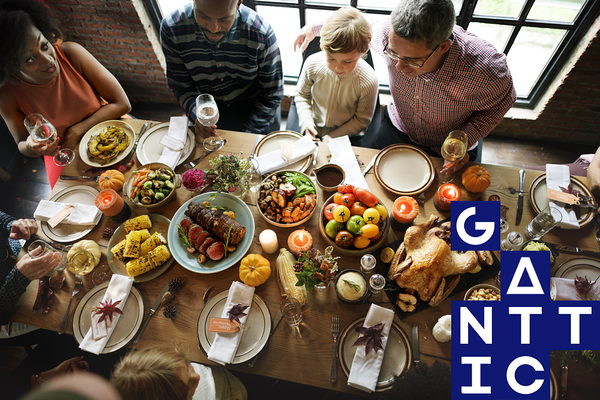 If you want to the night to be peaceful, change the subject or just go to the kitchen to stuff your face with the turkey stuffing. As a rule, your uncle will tell you that he doesn’t still actually understand what being a project manager means and your grandma will ask if you have a special someone and your mom will say that you work too much and your grandma will agree. Luckily, you have planned for this and you can already rehearse your answers. However, if your uncle starts getting tipsy, just get out from the room and go play with your brother a bit. Your uncle is a wild-card and you can never really know what he will say or do. At this point, resource planning has gotten you to the pie eating part of the evening. We could go over the guest leaving and you rolling to the bed, too. But we won’t. Go ahead, humor yourself to planning your family’s Thanksgiving dinner. Let us know whether it went according to your plans or you had to reallocate some resources and tasks! Oh, and have a Happy Turkey Day!